Why have some major political ideologues and activists often been tempted to fabricate or spin myths about their own lives? Moreover, what research challenges do such people pose for the historian when it comes to writing accurately about their careers? These are just some of the questions that arose in a lecture given by Emeritus Professor Colin Holmes at the Wiener Library last Monday evening (21st November). The occasion was a special talk and book-launch event for Searching for Lord Haw-Haw: The political lives of William Joyce (Routledge, 2016), a lecture and reception held by Routledge Publishers, in conjunction with the Wiener Library, an important archive and library on Jewish history and the Holocaust, which is located in Russell Square in central London. I was very pleased to be part of the audience, and to hear Professor Holmes deliver a fascinating talk on William Joyce (who became known as ‘Lord Haw-Haw’ during the War for his notoriously pro-Nazi radio broadcasts from Hitler’s Germany). 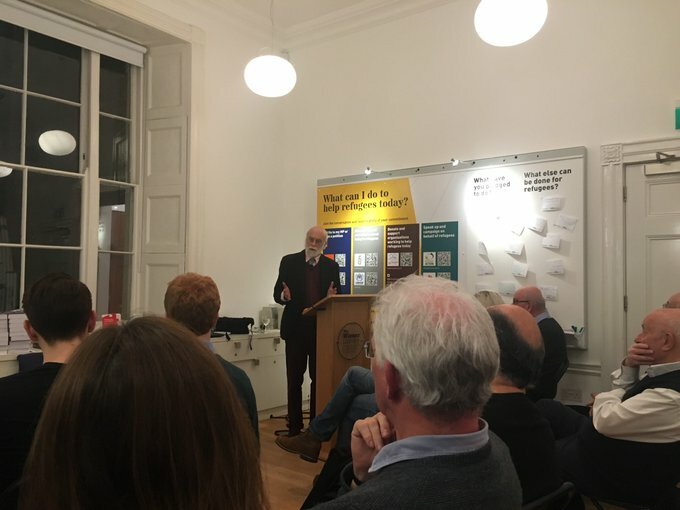 The talk was introduced by the well-known Guardian journalist, author and historian Francis Beckett, who has just published a biographical study of his own father, the fascist-supporting former Labour M.P. John Beckett, entitled A Fascist in the Family (Routledge, 2016). Francis Beckett spoke about the generous help that Professor Holmes had given him while he researched the life of his own father, John. Professor Holmes revealed some of the big challenges that he had faced when researching into the life and psychology of William Joyce who, from a very early age, began to ‘construct’ a number of versions of his own career, and sought to be deliberately obtuse or untruthful about some of the key events in his life, including – for example – his actual date of birth, the precise country where he was born, and the real circumstances surrounding the prominent scar that had resulted from him being attacked at a fascist meeting in London in 1924. Holmes also faced some tricky legal obstacles placed in his way by surviving members of Joyce’s family. 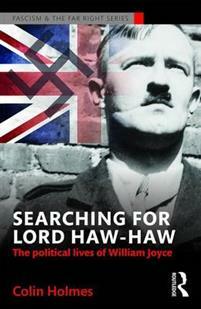 Prof. Holmes also pointed to some of the myths about Joyce’s life that had been uncritically reproduced in previous biographies of Lord Haw-Haw, including versions of watershed events in Joyce’s career that the ideologue himself had created and put out into the public domain, undoubtedly in order to throw people ‘off the track’, or to try to present him as a ‘heroic’ figure for future generations of racists, or to shape perceptions about him in the subsequent history books. Joyce maintained this manipulative strategy even after he was imprisoned by Britain and tried for treason, something that was very evident in his prison letters. As Holmes also pointed out, Joyce’s politics also became dominated by an obsessive Jew-hatred, an anti-Semitic hostility that ran right through his political career and which led to Joyce blaming the Jews for just about everything that he felt was wrong with the world. Moreover, Joyce came to embrace what can only be called an ‘exterminatory strand’ of anti-Semitism, which is possibly why he felt so at home in Nazi Germany, the country to which he fled (along with his equally pro-Nazi wife, Margaret) in 1939. Added to this, Holmes challenged (rightly, in my view) the idea often promoted by previous biographers and other commentators that the pro-Nazi English-language radio broadcasts made by Lord Haw-Haw from Germany in World War Two were somehow ‘harmless’, and were not taken seriously by British listeners. He gave examples of the notably negative impact that the mocking and doom-laiden broadcasts made by Joyce had exerted on British morale, leading – in some cases – to people commiting suicide. In the dark days of summer, 1940, it really did seem as if, after the conquest and defeat of France by Nazi Germany, it was Britain’s ‘turn next’, a threat that Joyce regularly voiced in his radio talks. What came across especially strongly, though, was Joyce’s strong narcissim and his yearning to become a major politician who would deal in grand schemes and human destinies. He could tolerate no shades of grey, sought simplicity and order, and tended to divide the world into good and evil. This latter point, repeated towards the end of Professor Holmes’ talk, also raised interesting points about some current-day and highly egotistical politicians, such as President-elect Donald Trump and the former UKIP leader Nigel Farage. There were certainly a few wry smiles from the audience when this topic was explored. All in all, I picked up some invaluable lessons about the challenges and processes of writing biographical accounts of history, especially if the subject under investigation is out to deliberately fabricate and mythologise key aspects of their lives. This entry was posted in Archives, British history, European History, Events, Fascism, German History, Public History, Uncategorized and tagged Archives, British history, Explore Your Archive, history, Public History, World War Two, WWII. Bookmark the permalink.